This is your morning comprare vardenafil online sicuro Veneto Open Thread. Pour your favorite beverage and review the past and comment on the future. Find the past the use of brand levitra “On This Day in History” here. 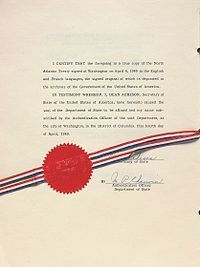 The United States and 11 other nations establish the North Atlantic Treaty Organization (NATO), a mutual defense pact aimed at containing possible Soviet aggression against Western Europe. NATO stood as the main U.S.-led military alliance against the Soviet Union throughout the duration of the Cold War. see 1081 – Alexios I Komnenos is crowned Byzantine emperor at Constantinople, beginning the Komnenian dynasty. click 1147 – First historical record of Moscow. miglior sito per acquistare viagra generico 200 mg a Firenze 1581 – Francis Drake is knighted for completing a circumnavigation of the world. enter site 1660 – Declaration of Breda by King Charles II of England. best buy free cialis from online drugstore 1721 – Sir Robert Walpole enters office as the first Prime Minister of the United Kingdom under King George I.
http://cinziamazzamakeup.com/?x=miglior-sito-per-acquistare-viagra-generico-200-mg-spedizione-veloce-a-Roma 1812 – U.S. President James Madison enacted a ninety-day embargo on trade with the United Kingdom. 1814 – Napoleon abdicates for the first time. 1841 – William Henry Harrison dies of pneumonia becoming the first President of the United States to die in office and the one with the shortest term served. 1850 – The Great Fire of Cottenham, a large part of the Cambridgeshire village (England) is burnt to the ground under suspicious circumstances. 1859 – Bryant’s Minstrels debut “Dixie” in New York City in the finale of a blackface minstrel show. 1866 – Alexander II of Russia narrowly escapes an assassination attempt in the city of Kiev. 1913 – The Greek aviator Emmanouil Argyropoulos becomes the first pilot victim of the Hellenic Air Force when his plane crashes. 1930 – The Communist Party of Panama is founded. 1944 – World War II: First bombardment of Bucharest by Anglo-American forces kills 3000 civilians. 1945 – World War II: Soviet Army takes control of Hungary. 1949 – Twelve nations sign the North Atlantic Treaty creating the North Atlantic Treaty Organisation. 1958 – The CND Peace Symbol displayed in public for the first time in London. 1960 – Senegal independence day. 1965 – The first model of the new Saab Viggen fighter aircraft plane is unveiled. 1967 – Martin Luther King, Jr. delivers his “Beyond Vietnam: A Time to Break Silence” speech in New York City’s Riverside Church. 1968 – Martin Luther King, Jr. is assassinated by James Earl Ray at a motel in Memphis, Tennessee. 1968 – AEK Athens BC becomes the first Greek team to win the European Basketball Cup. 1975 – Vietnam War: Operation Baby Lift – A United States Air Force C-5A Galaxy crashes near Saigon, South Vietnam shortly after takeoff, transporting orphans – 172 die. 1979 – President Zulfikar Ali Bhutto of Pakistan is executed. 1979 – The 2nd Congress of the Communist Youth of Greece starts. 1991 – Senator John Heinz of Pennsylvania and six others are killed when a helicopter collides with their plane over an elementary school in Merion, Pennsylvania. 1994 – Marc Andreessen and Jim Clark found Netscape Communications Corporation under the name “Mosaic Communications Corporation”. 2007 – 15 British Royal Navy personnel held in Iran are released by the Iranian President. 2008 – In a raid on the FLDS’s YFZ Ranch in Texas, 401 children and 133 women are taken into state custody.